246 pages | 4 B/W Illus. Preparing the Educator in Counselor Education is a comprehensive skill development resource for counselor educators looking to engage students, develop curriculum, and provide effective feedback. Chapters fully aligned with the 2016 CACREP standards and grounded in current research discuss topics including pedagogy, identity development, classroom diversity, student engagement, teaching strategies, ethical and legal issues, gatekeeping, and mentoring. The book is replete with guided practice exercises, descriptive commentary, illustrative case studies, and examples from seasoned professionals that provide context, humor, and encouragement. 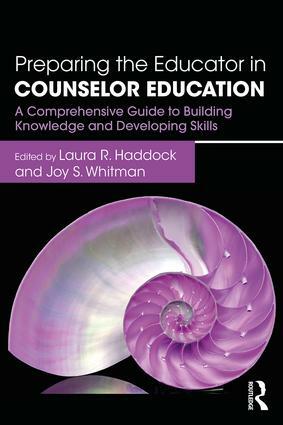 "Haddock and Whitman bring together, for the first time ever, a comprehensive collection of critical topics and components every counselor educator can use in the classroom in educating, training, and preparing future counselor educators. This text allows students to engage in open classroom discussions, case illustrations, and guided practice exercises, but, more importantly, each chapter stimulates thinking, reflection, and introspection. Every counselor education program would benefit from connecting their students with this text."